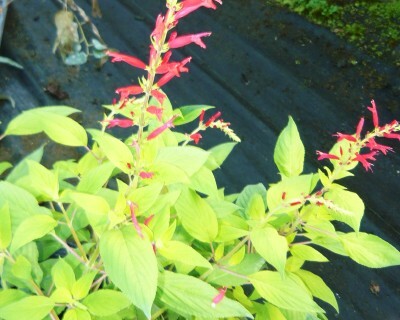 Golden Pineapple Sage (s. elegans 'golden delicious') Beautiful bright yellow leaved variation of Pineapple Sage. Same fruity scent and flavor as regular pineapple sage for culinary and tea use. Contrasting tall red flower spikes attract hummingbirds and also makes this a nice ornamental plant for the flower garden. Tender perennial zones 9-10. Live starter plant in 3 inch container.